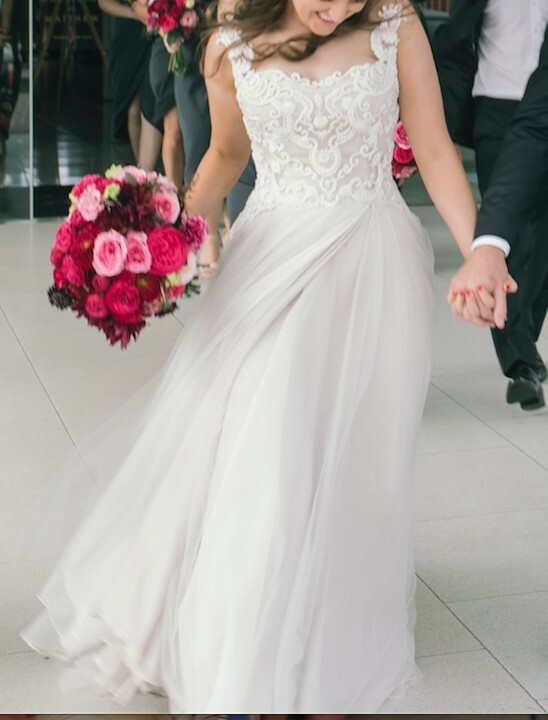 This original Annette of Melbourne wedding dress was the perfect dress for my wedding day! I received endless compliments on how beautiful the dress is and truly felt like a princess on my big day. I am selling my stunning dress as I think another bride deserves the happiness it will bring her on her big day! The gown is a multi layered tulle skirt with silk organza. It has a small train which you can wear out for a more glamorous effect or you can also pin it up to move around easier at the reception. The gown is pure silk with a hand made corset and inbuilt supportive bra. This is the most comfortable dress I have ever worn! The silk is an Ivory shade and the bodice was beaded in French tapestry to create more shaping within the lace and accentuate your features. It featured gorgeous silk buttons at the back for that extra glamour. Size 10, Cup Size E, 166cm tall, and I wore 10cm heels . The gown has been professionally dry cleaned. Veil is included if you wish to take it, I choose on the day not to wear it as I didn’t want to take away the detail of the gown. Once you send a message, Madeleine can invite you to purchase the dress.